I have been struggling to consistently get upwind. Some times I send it and get some time sailing off the wind as a result other times I spend the whole session on the wind just to return where I launched from. After two years I have the basics sorted, I can control ride height and fly clear of the water indefinitely. I am starting to make gybes with out falling. The problems are worse under 10 knots of wind with my 7.5 and its easier in breeze with my smallest sail. But I just feel like I am missing something going uphill. I try to keep the board heeled to windward, both feet outboard on the rail and front foot heel down. I try to get my body out over the water more. I focus on leaning the rig back and sheet in. I focus on looking upwind, twisting my head and torso to pull from the hook and sheet in. I try and drive the sail load through the back leg and keep my shoulders forward to control ride height. Many thanks, I am sure I am not the only one with these struggles! I am basically one of the few windsurfers in my area (Charleston SC USA) and the only one foiling so forums and vids are my only source. You are certainly not alone. I'm in a similar situation only using a 244cm x 72cm old slalom board. When foiling it can get upwind way more easily than when fin sailing, but I want it to be even easier. I'm still nowhere close to getting upwind as easily as I can kitefoiling, nor is it reasonable to expect I'll ever get to that point. Given that my board has a relatively pin-shaped slalom tail I find that moving my back foot closer to my front foot helps when sailing upwind, but still isn't enough. I'm currently finishing up building some new EVA footpads for my back feet that effectively allow me to put more weight on my rear foot driving the nose further upwind. I'm not sure how well it will work or if the pads made from yoga blocks will even stay attached to the board but I should know next week if we get any wind around my parts. The other thing I want to do is shorten my harness lines to allow me to sheet in a bit further going upwind. 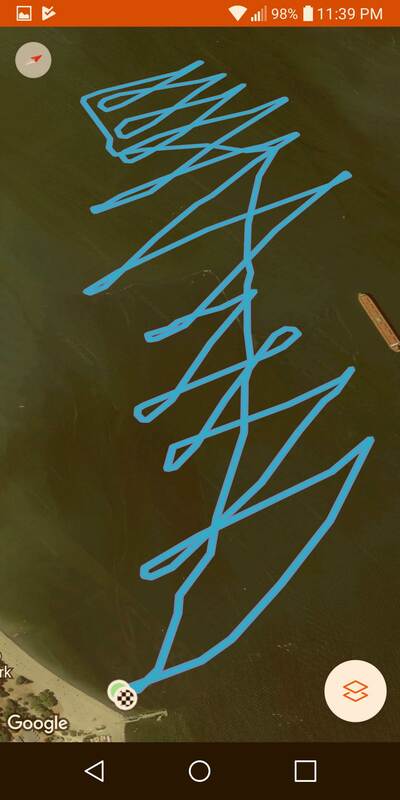 I imagine your Horue has a much better outline than my board for upwind sailing, but I thought I'd let you know that you're not the only one dealing with this. I'm the opposite I need to work not to go upwind. I think a big part of getting good up wind angles comes from the gear your using and set up. When you see professional sailers foiling in events. They are on really wide boards to get the leverage needed to handle the 9m+ sails. So bigger sails(7.5>)obously help with up wind angle but i also find going over 10m gets a bit heavy for my light weight. Ive been told a long fuse helps too. I'm sure one of the more veteran foilers on here will have some good tips. for your weight and 7.5 that's on the narrow side and you may not be getting enough leverage over the foil? Here is a couple of tips I found that helped..
1. Shorten the harness lines - I went from 31" to 27.5"
3. Depending on the draft of your sail, try moving the harness lines back a little a time. 4. I move the mast back forward 1" for my 7.8 and back for 6.7 and smaller. its ok to unhook in super light winds and use rig pressure to drive upwind. so by raising the boom and adjusting harness lines it made a huge difference. Interesting to see different techniques to get upwind. To me the main requirement is to have a foil that generates a lot of lift. The Slingshot foils we ride require a weight forward stance to counteract the massive lift they provide - the foils fly upwind. Keeping the board at about half mast helps. Harness lines not too short so you can get your weight outboard. You should be able to get angles similar to below with freeride gear (better again with race kit). You'll lose a few degrees in lighter wind but not much if you're powered up. 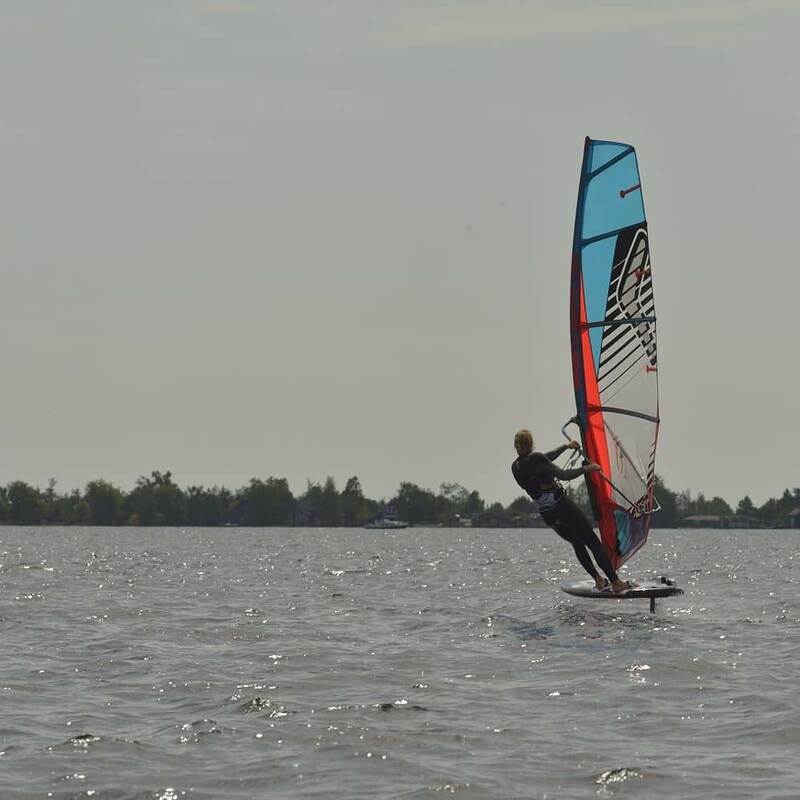 Yep, most of it has been covered by the other guys on here, but the short answer is wider boards and more powered up sails give you more leverage over the foil, and the power to drive harder up wind. Gonzalo Costa-Hoevel, the current world champ was here in February, and he was saying they don't use any sails under 8m. He was saying that the bigger sails allow them to keep more pressure on the mast base, keep the nose down, and you just use the power to drive harder up wind, or deeper off breeze when going down wind. The minimum width of the foil boards they use are 85cm wide to help get the leverage over the foil as well. I'm reading through the posts here and can see there is some good advice already. 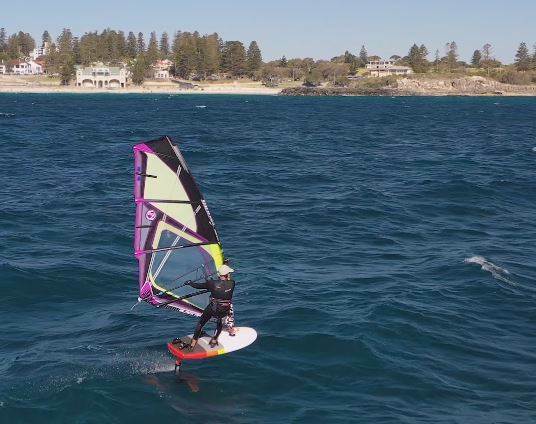 There is no doubt that a wider board will help with going upwind. The narrower the board is, the harder and more technical it will be to point. I don't know the Horuee foil personally. But saying this the boards we use ( for the same style of foiling you do ), are the Slingshot Wizard 125 and 105. They are 79cm wide and 76cm wide + Hoverglide Alu foils with the Infinity 76cm front wing. So the boards is 'quite similar' , but not sure about the foils? Four our weight 75-85kg, (the slingshot riders with the same boards here) we use max 5.8 - 6.5 in really light wind down to 8-10 knots and is still going effortless upwind quite well with no problems. We are more focused on nearly using as small sails as possible, but getting a loft of lift from out foils / wings. 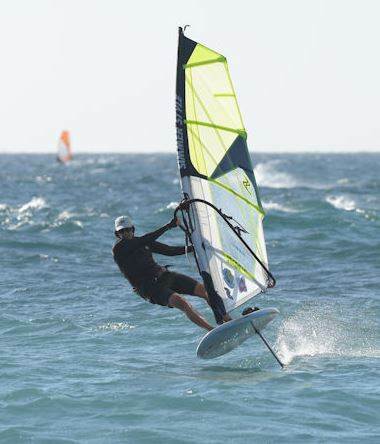 Best thing is to try different setups from other guys, as then you will quickly realize the difference in the foils / boards / sails and draw some conclusions on you own set up. I understand this can be a bit hard, if you are just a few guys around where you sail (think you mentioned this). 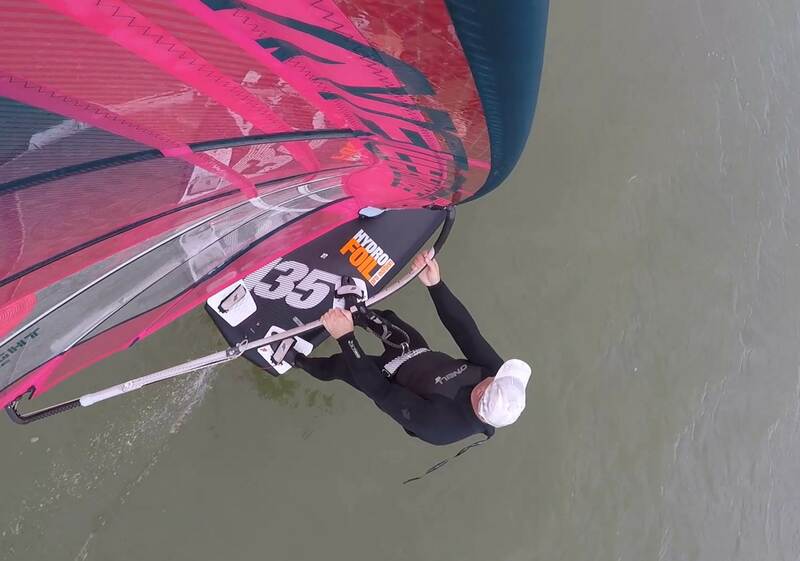 To have a bit more tension on the leach in the lighter wind can help a lot (little less downhaul), as this gets 'a bit more power' to the foil to lift. Reading about your trim, I still think the main factor is the foil in itself. In comparison we have a lot of front foot pressure and even upwind we can point, without having the back foot in the strap (just in front of it), if we want too. It just sounds like you have a little less lift from your foil, with having to have a lot of back foot pressure. Nothing wrong with that, but just require a bit more effort in the lighter wind I guess. 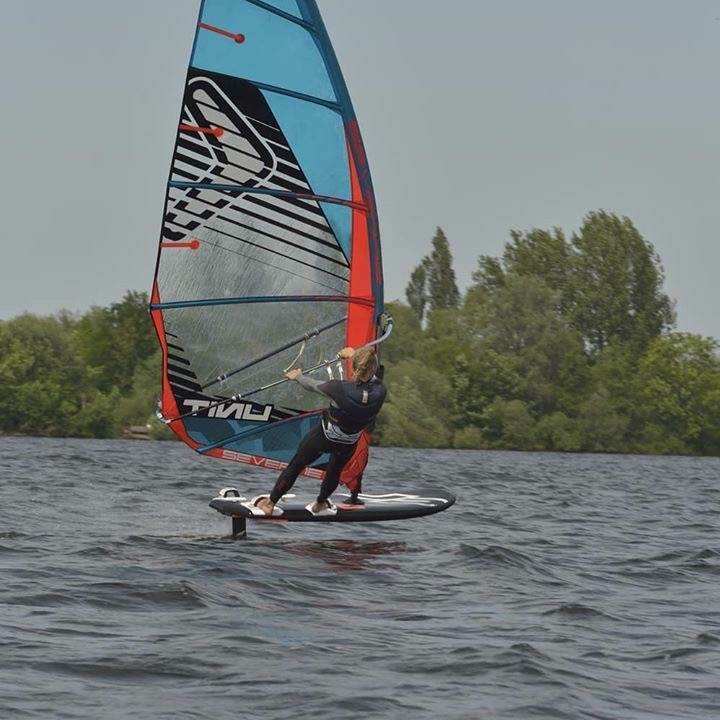 I have ridden several foils including the Horue. 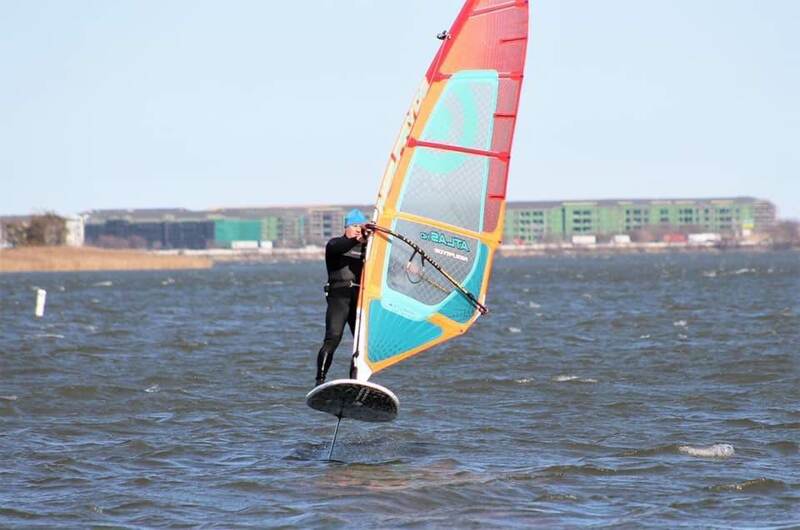 The Horue is among those foils that likes to be ridden more vertically rather than "heeled over". It'll heel a touch but, in my experience, don't try to mimic the PWA guys. The XLW wing is quite lifty. While it's smaller than some of the freeride wings, it's very efficient. 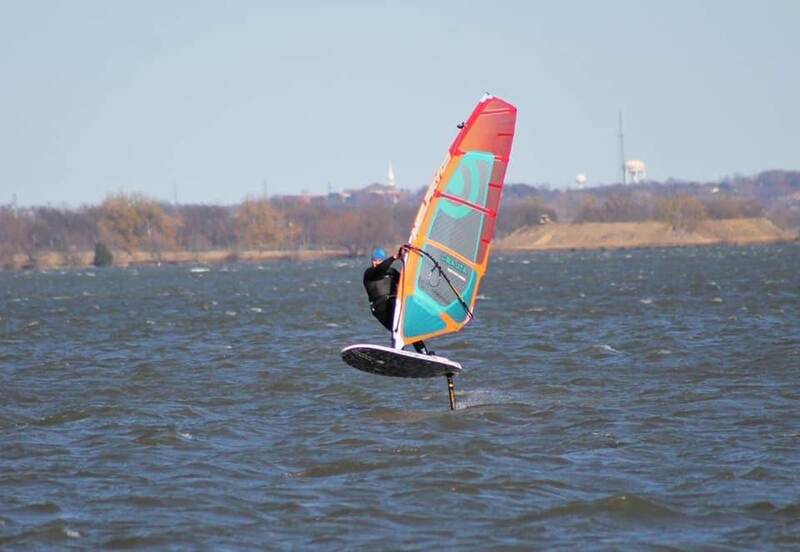 The thing that helps with all foils is to get going as fast as you can on a reach before trying to go upwind. If you just plonk along trying to rake the sail back, you'll struggle. Get ripping as quick as you can and then foot steer it upwind. To me, the technique is a lot like a formula board. If the board feels like it's slowing down in a lull, then bear off to regain speed before pointing back up. Horue XLW with 5.0 in 6-14 kts (according to poster). Since you are bigger, you'll likely be on more sail in the same conditions. 1st. your board is relatively narrow and your foil is freeride oriented, which means it just wont go upwind like PWA kit. 2nd. Upwind performance is just less when not powered up enough. 1. I Don't see how banking would help. I see banking as more of a result than a goal. Banking reduces power in the sail too.. Look at vids from the dutch olympic team in new zealand, in 6kts they fly their boards completely flat for max power! 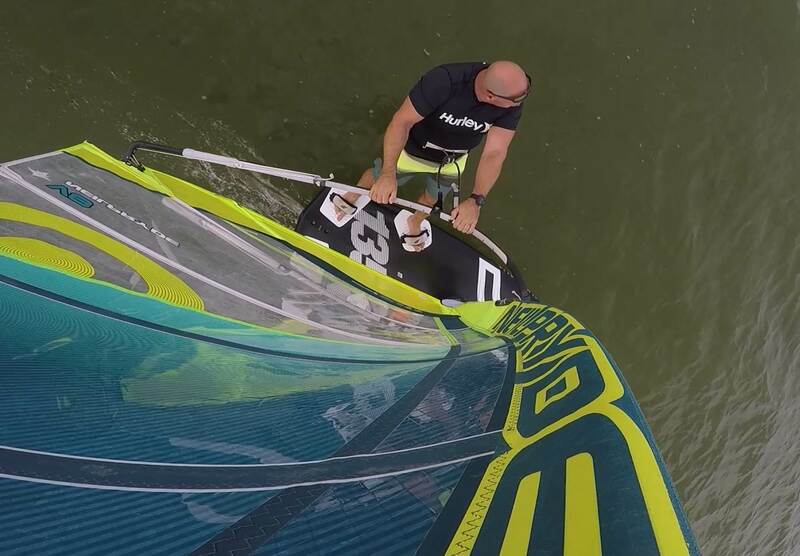 Those vids you see on fb and instgram of the PWA riders flying upwind are often powered up (14-15kts) with 9.0's or 10m sails! 2. Shorten your lines! 28" like recommended above is quite short still, in light winds I go down to 26-24 even! 4. Also put your front foot further out on the rail (many do the backfoot automatically but forget the front foot) and back! A narrower stance (given the backstrap is setup correctly) = more upwind power. Since you want to keep your board flat you might want to try pushing against the board more laterally than vertically, so putting your feet more on the rail like you're sailing formula/slalom and pushing against the mast. (Once again look up some vids of the dutch olympic team in new zealand) This also works a lot better with a wider board/stiffer foil because of the added lateral stability that offers compared to your setup, so you would have to try to what extend it works. 6. Push yourself away from the boom and make the perfect 7 shape! No bending at the hips, that kills the powerdelivery! Same goes for bending the knees, you are not going over chop, so you should be able to keep legs maximally straightened 100% of the time (and regulate power fore/aft by moving the backhand forward and backward, and canting more towindward or keeping the board flatter to spread your bodyweights load over the legs and the mastfoot.) Also, when really minimal, sail with an upperhand grip. if ill think of anymore ill add it. You can try grabbing the uphaulrope with the front hand or let it go alltogether, when your technique / setup is correct you don't need it anyway. tbh I have been having a lot of the same problems until recently, some of which are caused by the sailsize (which just doesn't work aswell as some others) in relation to the foils power. A 7.5 on the 120 tiny is already quite big. I wouldn't dream of putting that size sail on such a narrow board and expecting good upwind performance.. My rule of thumb, compare to size recommendations for similarly sized slalomboard and substract 2m for foiling. For your tiny of 73 wide I'd say 8.6 as biggest in slalom, so for foil max would be around 6.6 and any bigger will be off balance. Ofcourse smaller than 5.0 is absolutely fine, but my rule of thumb works very good for the max efficient sailsize. Thanks for all the feed back! Thanks everyone for your time and input! It has given me the confidence to keep charging knowing I am on the right track! I'm just off the water from two sessions where my upwind skills really improved! Yes, the 7.5 is a big sail on a tiny board. It gets little use these days, as I get better at pumping, the 6.0 boosts in almost as low wind any way. All comments about the challenges of light air really help me manage expectations. I was fortunate to get a reply from Wyatt Miller, he said put your back straps back on and focus on edging (banking or heeling to windward). That helped a bunch; the back strap gives the back foot the ability to apply torque for steering and edging. Phil from Horue is always quick to reply, he said send me a video which I am still editing. I will try and post it here. Sam Ross took some time to reply a while back, his comments: Bigger the rig, the more outboard you need to be, to create sufficient heel to get upwind. Bigger the rig, make the foot straps smaller. This will help you maintain heel pressure, especially the back strap. Boom shape, which boom are you rigging your 7.5 on? If you can rig it on the narrowest profile boom you can, maybe a big wave boom. This will give you more distance from the rig. Move the boom up as the rig gets bigger. Shorten your harness lines as the rig gets bigger. I love that the pros are supportive in this sport! 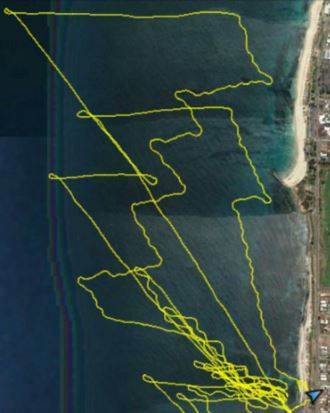 My hat is off to anyone who can Kitefoil! And I love that you want to windfoil too! You are a waterman! I was thinking of "building out" the deck of my board; let us know how the eva foam works! Where is your boom height? Is it shoulder, chin or eye height? It would be good to hear that data from the others as it ties in with line length. Or is it that when set up correctly it is really hard to reach the harness line with the hook? I think I noticed the lower back twist thing today, particularly off the wind. I will try the boom higher still. When the group talks about harness lines, how are they measured? Can they be measured on the boom by doubling the length from the boom to mid harness line? I will err on the side of high boom short lines, same info from lots of good sources. Your tracks and footage are inspiring! How many hours was the session that made that track? Our boards are similar in width. The tail is pulled in more on the Tiny so it has less leverage on the foil. I feel the lift at LOW speeds is a key contributor because you can't point until you go faster than take off speed. If your take off speed is lower than you can switch to VMG (Velocity Made Good) mode sooner and more often. The Slingshot gear looks good for that, I need to get out on that gear and feel the difference. The Horue has piles of lift so long as you're moving fast enough. I just lined up against a long board in marginal, he won handily because he was making good VMG all the time not just in the gusts. A lot of times in sailing boats the set ups with a slower top speed win races because of better VMG. Your right, big sails are what drove me away from windsurfing the first time. I am weary of the wider board and bigger sail route. Really just want to keep it simple, use small light gear but have the biggest wind range I can. I want to optimize my kit and technique to be more like sailing boats and long boards, one hull and a couple of sails with good light air and upwind performance. You have got to get up to get down! The faster you get upwind the more time you can spend carving! Always good to get her ripping then harden up on any sailing rig! Your comment about foot steering into the wind had a profound effect. Coming from sailing boats I expect the foil to have "weather helm" but it doesn't, you have to steer it up wind by leaning it over. All the time. I was foot steering just not always or consistently. Without the constant lean there is nothing to counter the leeway and lee-helm from the sail. I have been enjoying the footage from the NZ nationals too! I understand your point about banking, the more juice you have the more you bank and vice versa. I believe there always needs to be some bank (1 degree?) to sail upwind. It creates a lot of leeway resistance, "weather helm", balance and stability needed to sail upwind especially in waves. It is happening less now but I often get pulled over center and shoved downwind by the approach of steep chop or waves. I am attributing this to not having enough righting moment at the time to torque to foil back on the wind away from the waves energy. Perhaps my body weight should be further out which will come with time and confidence. Your comment about power in the hands =power in the feet, makes perfect sense! I worked on moving my back hand with the gusts and lulls and noticed the difference. I am working up the nerve to let go of the front hand! I agree Spanwise flow is slow, glad to see the area being added to the foot of racing sails. Keeps the rig vertical AND closes the gap. Sounds like you made heaps of progress in 2 sessions! Just to clarify added 2 photo's of my style (which i ofcourse think is best lol) ;). i ride my boom way up high, practically all the way up in the boomopening for 192cm length. (6'2" i think? No idea honestly) and 24-28 harnesslines as i said earlier ;). i only have the freestyle and formula foil kit left, so the pic is from over a year ago.. bottom pic is a little more powered up than the top one. My boom is nose to eye height (I am 5' 10"). Which is much higher than what I windsurf with (that was chin high). 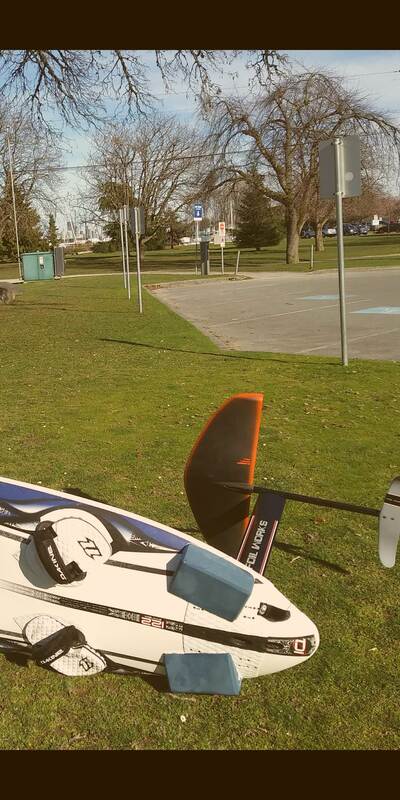 I got out today for the first time in good conditions with the foam yoga blocks on the tail of my board. I also screwed in some old kiteboard pads under my front straps to offset my balance with the new foot position in the back. The results for getting upwind were impressive to say the least. I feel like i added 10cm to the tail's width. It helped i had 15-20mph, but i was able to get the upwind angles i've been after all along thanks to being able to drive off my rear foot hard. I never would have dreamed of sailing half that far upwind a few years ago, nor have i ever enjoyed going practically straight downwind so much. 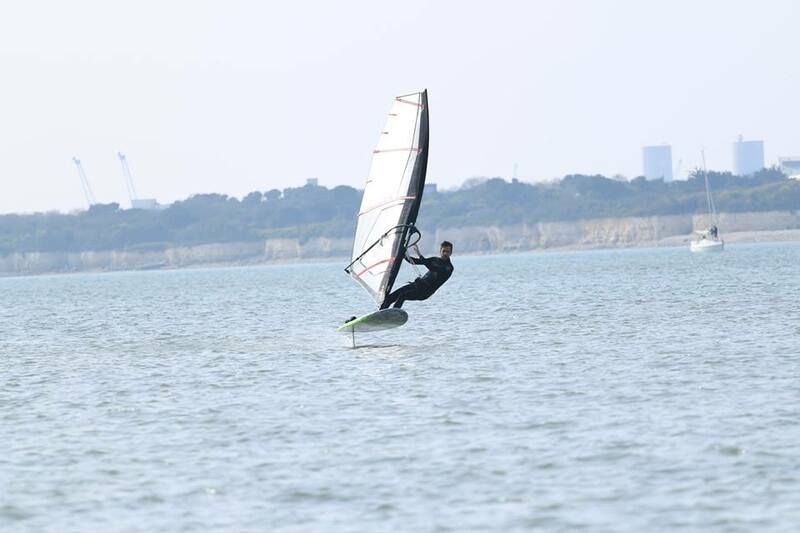 It felt like SUP foiling only the sail was the paddle.